With an increasing population of elderly people in our region, the problem of "bed blocking" or delayed transfer from hospital is unlikely to go away. We reveal that despite improvements, more than 65,000 bed days were still lost in the East last year. It is a significant problem for health and social services managers. In the East, around 8% of the population are over 65 which is higher than the national average. Of the 5.6 million people in the region, 448,000 are pensioners. But what is bed blocking? The term is really journalistic shorthand for the delayed transfer of a patient from hospital back home, or into some other care, such as a nursing home. 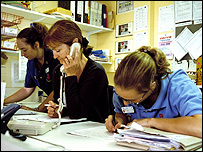 The patient that has received whatever treatment they needed from the main hospital cannot be discharged. There are several factors that contribute to bed blocking. They might include waiting for a place in a nursing home to come up, having special adaptations made at home or needing some kind of rehabilitation care. The hospitals have to liaise carefully with primary care trusts, which run GP surgeries and community facilities, and with social services, which are in charge of care for the elderly. At the Ipswich Hospital, managers have introduced a new system - a rapid assessment unit - which they hope is alleviating the problem of bed blocking. 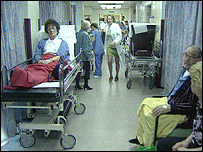 In the year 2004/5, the hospital lost 10,694 bed days because patients could not be transferred to other forms of care. That figure reduced to 9,801 the following year and so far, in the current financial year, the figure stands at 5,156. Andrew Reed, Chief Executive of the Ipswich Hospital, says the issues around delayed transfer are complex - but that the patient's best interests should be at the heart of any decision. "We have made a lot of progress recently in this," he says, "but we still have a long way to go. "The critical factor here," he continues, "is that the patients do benefit from the specialist treatment the acute hospitals provide but they also benefit from more appropriate rehabilitation or longer term care which we just cannot do as well as some other providers out in the community." 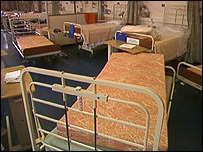 The rapid assessment unit has 20 beds, and patients stay in the ward for a maximum of seven days. Doctors and nurses can then asses each patient, looking at how quickly that person can be treated and how easily they can be discharged from acute care. "It is a portal by which people come into the hospital," said Mr Reed. He said that for some patients, particularly the very elderly, hospital treatment and discharge can constitute a major life-changing experience. "They may perhaps have to move from independent living to residential care, for example," he says, "and that is a very big decision for some families. It may need a lot of preparation to help them make that decision." Mr Reed was adamant that the drive to cut down the amount of bed blocking was not linked to financial constraints, although, he says, the two things were often "confounded". "There is no doubt that the more people are now admitted to hospital with very complex needs, and that is associated with age. "They have more complex medical problems and they need a lot of planning and different treatments. That is why we have to focus very early on when they are likely to be discharged and where they are likely to go to," he insists. Mr Reed added that the success of the rapid assessment unit was closely tied with the good working relationship the hospital trust had with social services and the PCT in Ipswich. Join the Politics Show team on Sunday 03 December 2006 at 12:00 GMT on BBC One.